Christmas is just around the corner (1 week to be exact) and to say that we are excited would be the understatement of the century. Bentley is getting to be such a fun age. His personality is really starting to show and we are having the best time ever. Last week I posted a picture on Instagram of Bentley checking out his stocking. He knew exactly which one of his! He got those smart genes from dad ;) Oh, and don't mind my blurry Bentley pictures from now on. We have officially entered "that stage" where Bentley can't sit still for longer than 2 seconds. Always keeping me on my toes this one! I made our stockings last Christmas. It was Bentley's 1st Christmas and up until then we had never invested in stockings. I know, I'm not sure what we were thinking! I really wanted something that was going to be uniform for our family, but still personalized and individual for each member! I took my idea to my mom and we went to work. I am going to apologize now that my directions may be very confusing! This DIY was a bit more advanced and initially I needed my mom to help me through it. Thank goodness for my mom, she is pretty much amazing. It's always nice to have another person to talk my ideas out to. Love her! My mom had a stocking on hand and I liked the shape so all I did was flip it inside out and traced around it. 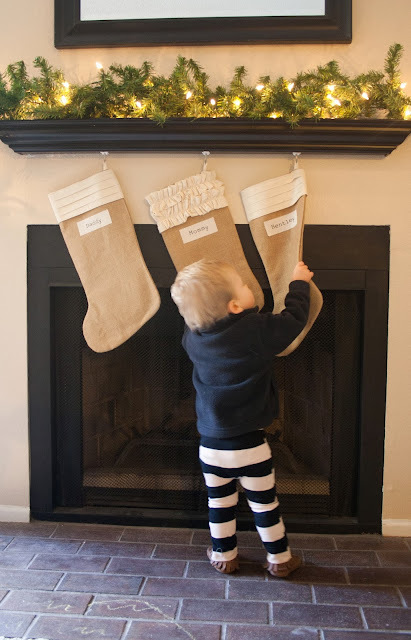 If you do not have a stocking already, google "stocking outline" and there are tons of options available for you to print off and trace. You will need to cut out two stocking shapes (front & back) for 1 stocking. I also lined my stockings with muslin so you will need to do the same with your muslin fabric. The reason I chose Upholstery Burlap was because it is so thick. I didn't want our stockings to fall apart after 1 year and fray like regular burlap tends to do. I wanted these babies to last for a looong time! Match up a burlap and muslin piece together. with a 1/4 " seam allowance. Once you have the burlap and muslin based together, pin right sides together, and sew with a 1/2" seam allowance. I chose to reinforce this seam using a zig zag stitch between my straight stitch seams, then graded (trimmed) my seam allowance to get rid of bulk. Next, you will need to fold down, pin and finish the top edge of the stocking to keep it from fraying. 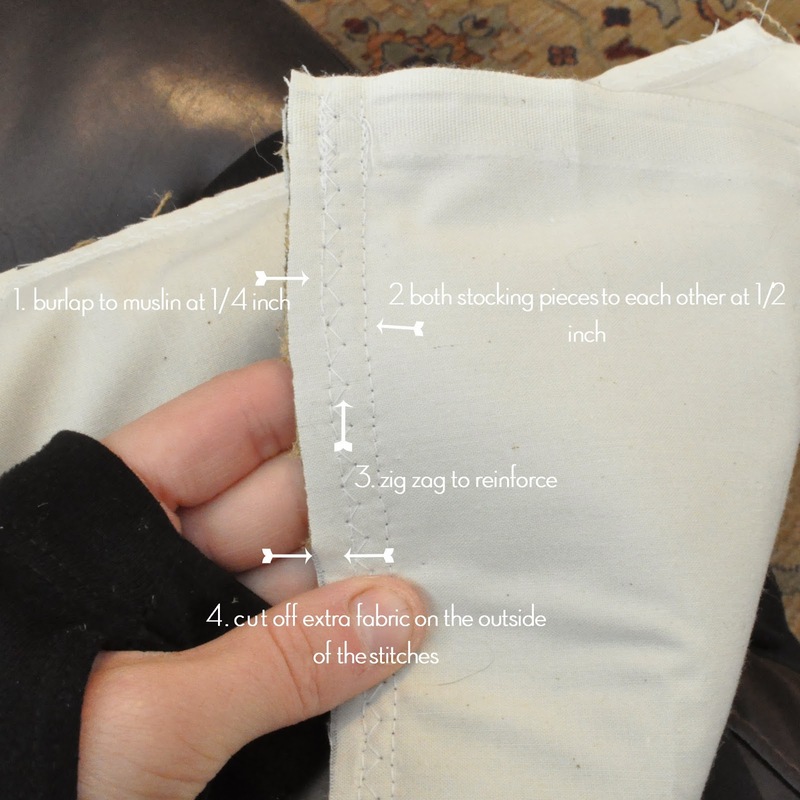 For a boy stocking, you will need to cut a strip of fabric 10" by the width of your piece of fabric. This will give you enough pleated material for 2 stockings. On one of the long edges (this will be the back side), fold over a 1/4" seam and press that all along the long edge. 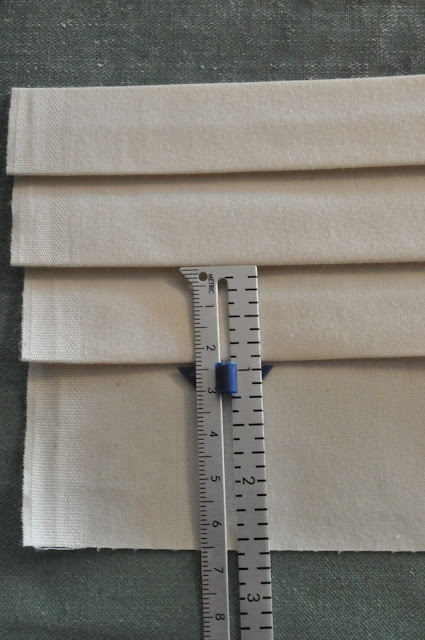 Turn your fabric to the right side and using a seam gauge measure out your pleats. I did pleats that measured 1". Press as you go along the length of your fabric. My boy stocking had 4 pleats all measuring 1". Wrap and pin the pleated fabric around the top of your finished stocking. Leave yourself enough fabric on the back side of the stocking to fold over the unfinished edge. Make sure this finished edge is on the back of the stocking so there is no visible seam on the front. Top stitch the pleated fabric to the top edge of the stocking. Finally, you will need to pin and stitch the back of the pleats to the back of the stocking. The picture below is the completed boy stocking from the back side. Cut 2 strips of muslin 5" by the width of the fabric. I chose to use 2 ruffles at the top of my girl stockings. This will give you enough ruffled fabric for 1 stocking (if you choose to do 2 ruffles). Fold the strip in half the length of the fabric and stitch the unfinished edge at 1/4" seam allowance. Turn this long tube right side out and press. Using a sewing machine basting stitch or alternately a needle and thread by hand, run a basting stitch down the center of your tube of fabric. Gently gather your fabric pulling the basting thread to create your ruffles. Once you have ruffled the length of your fabric, pin and adjust along the top edge of your stocking. Attach the ruffle to the stocking by stitching on the center basting stitch using that as a guide. You may need to hand stitch the 2nd ruffle down. I was able to do it on my sewing machine but it was pretty awkward with it being so far down the stocking! I wish I had taken a picture of this when I had done it (duh, what was I thinking) but I will try to explain this as best as I can! I cut a piece of muslin to 8.5" x 11". I attached that piece of muslin to a Full Label sheet (it is sticky on one side) and ran the muslin through the printer with our names! You will want to do a test page on a blank piece of paper before you actually print your names on your muslin. Once I had my names printed on the muslin, I cut my name patches to approximately 1.5" x 4". Finally, you will need to hand stitch the name patches to the stocking! 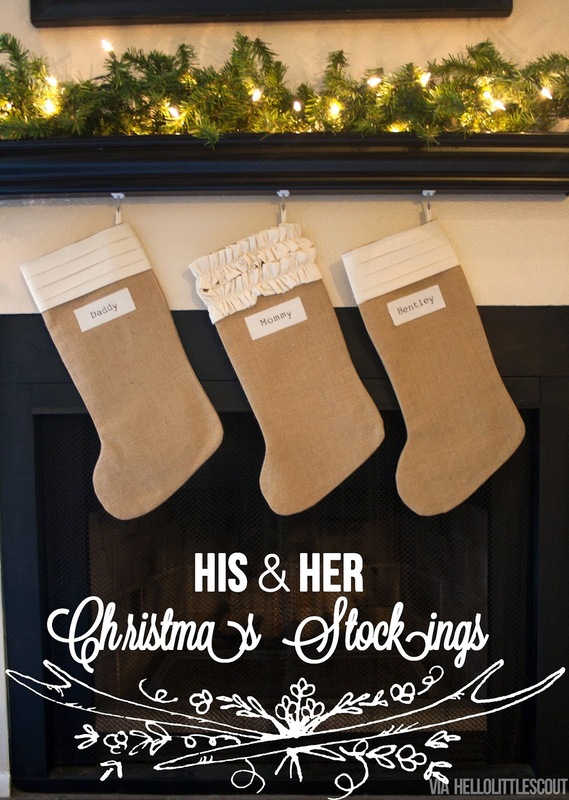 And there you have it, personalized stockings for the girly girls and the handsome dapper men! Please let me know if you have any questions or if you need any clarification! And getting a little to sit still for even 2 seconds is such a challenge! But, this stage is by far one of the best/most fun. Enjoy Utah, and have a very Merry Christmas!! These stockings are so cute!!! I love them! I wish I could sew! I have my own sewing machine, but haven't gotten it out once since Max was born. I swore up and bown I was going to make baby clothes, but...... that never happened. I came across your Instagram account & saw these adorable stockings! I love them & I'm totally going to make tees for next Christmas. Thanks for sharing. I'm excited to follow your blog! Obsessed with your blog and your moccs! Cant wait for the pink! Those are cute! I want to make new ones for next year. Hope your holidays went well and all is well!